Somewhere along the way I've gotten addicted to morning tea. I'm not sure when it happened but I've come to really look forward to a mid morning cup of tea and a sliced of something baked. And while I think terms like guilt-free are unhelpful, I do want to feel good about everything I put in my mouth. 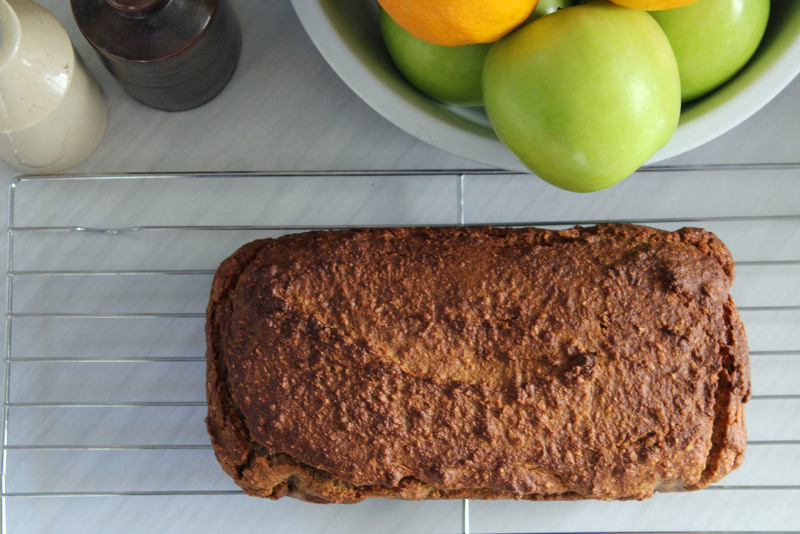 This moist, delicious banana bread is my morning tea constant. I've used almond flour and coconut to form the flour component and it's lightly sweetened with 2 ripe bananas and a couple of tablespoons of honey. Gluten free baking like this loaf appeals to me because it's so nutrient dense. There's not loads of refined flour or unnecessary sugar. I notice the difference in how I feel when I eat this way and I'm quite happy to make it a daily treat. The added bonus is that baby Bonnie can enjoy some too. I've used honey to sweeten this but you could easily use dates or maple syrup instead. In a food processor add eggs, honey and vanilla. Mix until well combined. Add the banana and combine. Add the remainder of the ingredients and mix well. Pour the batter into a loaf tin lined with baking paper. Bake for 50-55 minutes until a skewer comes out clean when inserted. Allow to almost entirely cool before slicing. Enjoy as is or with a thick spread of butter.